This first responder from Westminster, who is an avid advocate for fire safety, picked up a $50,000 payday playing Powerball. 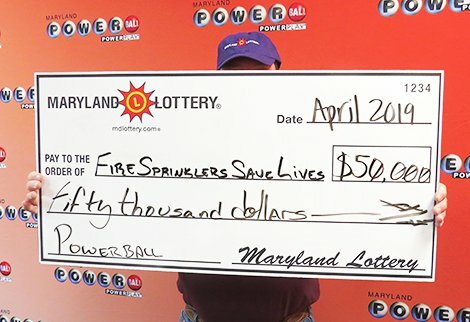 Although thrilled about winning a $50,000 prize in the March 27 Powerball drawing, a first responder from Westminster who works at the National Fire Academy in Emmitsburg is even happier talking about protecting homes and lives from fire. In fact, he’s so focused on the issue, he chose the nickname “Fire Sprinklers Save Lives” for publicity purposes. The winner’s smokin’ hot story about his big win begins on March 25, when the Powerball jackpot had rolled to $750 million. “Fire Sprinklers” went to Jubilee Foods that day at 515 East Main Street in Emmitsburg to pick up a few items. An employee behind the counter was already standing by the Maryland Lottery terminal, so he asked for two Powerball numbers and handed her a $20 bill.